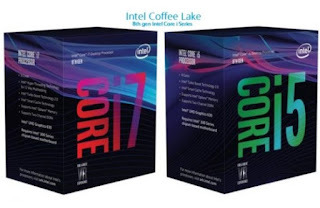 Although Intel has just officially released the 8th generation Intel Core U Series processor, the presence of the 7th generation Intel Core processor Intel Coffee Lake seems to be a matter of time considering it has recently emerged online a packaged box display showing the presence of a processor the. As reported by many parties, including Tech Report, who reportedly claimed to have seen the packaging package of Intel desktop processor box (Coffee Lake) Core i7 and i5 8th generation is posted through the official website of Intel. Indeed the picture was indeed plastered before it was eventually replaced with another image that actually represents the existence of the 8th generation Intel Core U Series processor which at that time was indeed at the release stage, according to Intel’s own confirmation. In addition to displaying a new color scheme, the packaging box on the picture appears to confirm the rumors of increasing the number of core Intel Core desktop processors to the 8th generation. Unlike the 7th generation processors are usually only crammed with 4 cores, the number of core Intel Core i5 desktop processor and 8th generation Core i7 (which is contained in the packaging box) is said to have been upgraded to 6. So for 8th processor model gen Intel Core i5 will be equipped With 6 cores and 6 threads, while for 8th processor model gen Intel Core i7 will come with support 6 cores and 12 threads. About the integrated graphics processor in the new chip will reportedly also be renamed to “Intel UHD Graphics”. Although the name implies high-resolution display output, the changes in the integrated graphics are expected to be very small, so that the performance of the graphics that diusungnyapun seems to remain the same as the existing model. The new chip is said to still support two DDR4 memory channels, Turbo Boost 2.0 clock management, and Intel Smart Cache and Optane memory support. Not only that, the box packaging figure also appears to ensure one thing that will probably make the users of previous generation Intel Core processors get ready to be disappointed because it must be maddening motherboard that he uses today. The reason for the sake of running the Intel Coffee Lake desktop processor, the motherboard used must be 300 berchipset motherboard that notabene not been announced so far so can not use 200 berchipset motherboard previously intended for Skylake and Kaby Lake. Then regardless of it all, how the next Intel Coffe Lake gait on the market competition map of the processor in the future? Will it boost Intel’s big name or will it take place or even back off? Well all that of course passed on to the quality carried by the successor to the 8th generation Intel Core processor.